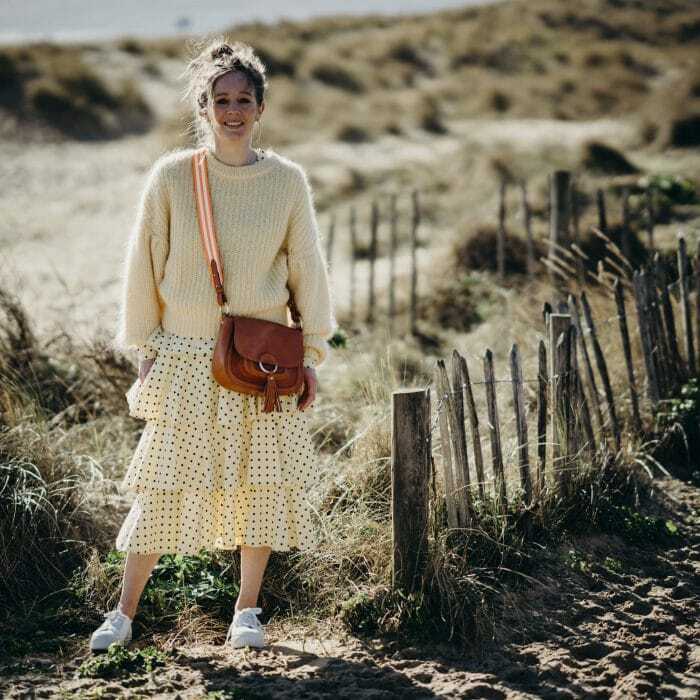 The sun came out and we headed to the beach to shoot some of our new season favourite looks from our Super Scandi Brands Baum und Pferdgarten and Essentiel Antwerp. With a focus on colour that you can wear now without freezing, we layered up for a feminine but strong look. Think of this look as a brand new basic – a fluid midi skirt teamed with a chunky knit and the ever faithful (will not owe you a penny) leather biker jacket. Whilst the wish list biker will always be a Belstaff other brands do an amazing job particularly Oui, Set and Mos Mosh. This season there are checks, stripes, chevrons and spots everywhere, the decision is just what to clash with what and how many candy colours you want to pull off in one look. Our approach of ‘more is more’ seems to be working with a new take on a tartan mac, a military stripe denim and an 80s chevron knit all from Essentiel. The march of the animal print continues but this Spring we see it remastered with colour – reds, pinks, greens and blues are all there for the taking. We have layered a great midi dress from Baum with a soft and super light yet chunky cable knit from Essentiel. Embrace a colour and go head to toe for a new season statement. Sherbert yellow is everywhere and few have done it better than Baum und Pferdgarten with this pretty cool ruffle midi skirt.